The Mudstang does not have to go back for cleaning and servicing until five o'clock Friday so what, apart from finish packing and have breakfast, to do today? The direct route up I-25 to the airport is but two and a half hours and 175 miles away, which would make for a rather short and unexciting day. So I retraced Thursday afternoon's excursion as far as Florence before turning and left and aiming for the gap between Pueblo and Cañon City before striking north-east for Colorado Springs. The latter brings traffic jams of the type induced by something other than roadworks, railroad crossings (they tend not to be very "level" in this part of the world) and, off to the left, Cheyenne Mountain, under which is the US Air Force's premier-league SEEKRIT Bunker. Although it's not actually used any more chiz. 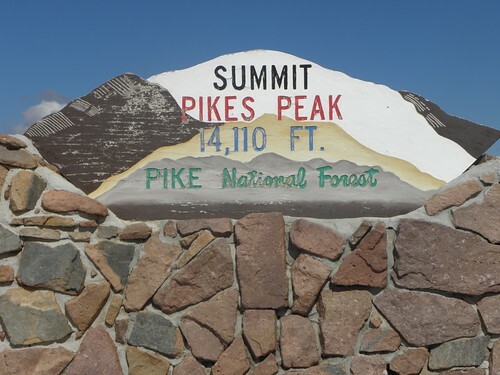 The only other thing worth seeing around here1 is Pike's Peak, named for one Lt. Zebulon Pike who passed this way an hour ago with his friend, a jealous monk some time in the nineteenth century - he was also the first to explore the Royal Gorge. He did not, however, scale the mountain which now bears him name, proclaiming any ascent to be totally impossible. Looking at it from the lower slopes, you can sort of see his point. 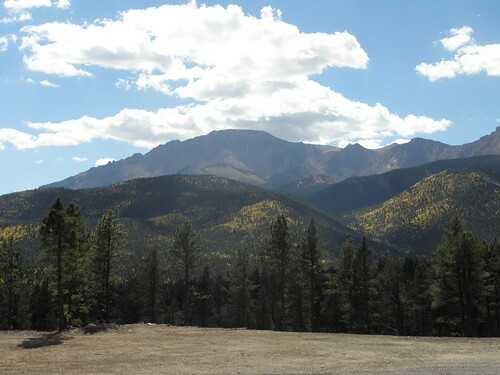 Autumn is on its way to this past of USAnia; previous visits to Pike's Peak have been a couple of weeks earlier. Halfway up the mountain and the fuel warning light comes on, indicating an estimated fifty miles of motor-spirit left in the tanks. 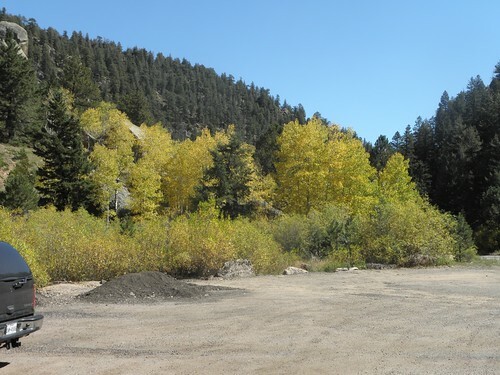 Plenty, I think, ten miles up and twenty-five back down to Manitou Springs. Or is it? OR IS IT?? Plan on at least half a tank of fuel. 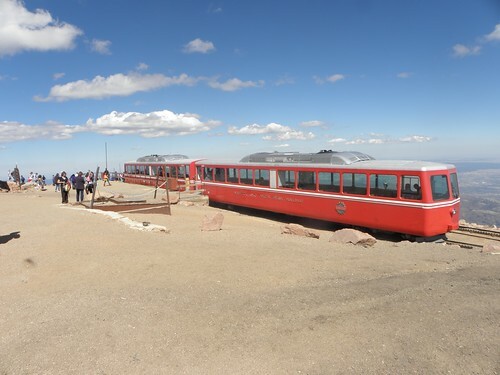 The trip to the summit and back is 38 miles and uses 80 miles of fuel. Smart people come up by train and then cycle down. Also at the summit was Greg. Greg had been hiking up with his friend/boss when his knee went "SPANG" at 13,000 feet. The train was fully-booked so he was attempting to scrounge a lift back down. I'd have given him a lift anyway but the offer of twenty bucks clinched the deal. A short period of photography and then down, with one eye on the motor-spirit readout. Greg was excellent company - he lives in Colorado Springs, is originally from Connecticut and had lived for a while near Bristol - and we chatted about cabbages and rhinoceroses in the kitchen nothing of much significance all the way down, having passed the brake temperature check with flying colours. If your front brakes register more then 300° F on the ranger's Gadget you are sent to the Sin Bin, which fate befell the Ultimate Driving Machine in front of us. Mine were but 238°. Hurrah! I dropped Greg at the bottom and set forth for Manitou Springs. It's still downhill all the way, leading to coasting down the 45 mph-limited twiddly bits of US-24 at up to 65 before pulling off into town, with the dash having been stating "0 miles to empty" for the last few minutes. Manitou Springs is another tourist trap, the speed limit in town is 20 mph and parking is at a premium. Throw in the odd unfamiliar roundabout, a visitor from Florida looking for somewhere to stop and the "gas" station Emily assured me was just THERE on the left being nothing of the sort, it was snacking on the fingernails all round until mercifully another source of motor-spirit popped up on the right. Fifty dollars will not only see me back to Denver but with luck might fool Mr Budget into thinking the tank is still full. It was at about dollar forty-seven when the peace was interrupted by a car horn, followed in short order by a loud bang. Small car turning into "gas" station halts behind stationary pickup. Which begins to reverse, for no readily-apparent reason. Much sounding of Audible Warning Of Approach before the inevitable. The pickup driver is blaming the car driver, President Obambi, ISIS and Slenderman as it was clearly Not His Fault. They are still going at it hammer and tongs when I leave; it is not beyond the bounds of possibility that at least one driver is armed. The bloke behind the counter is definitely armed, being a full-on Sikh with a magnificent beard, turban and doubtless the other accoutrements that go with his religion. Eighty miles to the airport. Traffic. Idiots. Yes, you in the BIGI and your ridiculous lane-changing manoeuvres! I get the Mudstang home with twenty minutes in hand. The Budget Bloke, who looks alarmingly like The X-Files' Bill Scully USN, merely reads the Dutch graffiti and smiles. A bit. The plane will be late, because they have had to change it for another one. My seat has changed too. Things to do in Denver when you're not quite dead: watch my fellow passengers crowd around the gate thirty minutes before they even start boarding, which is done strictly in order of Wealth, Children and proximity to the back of the aircraft. Thereby gaining the sheeple naught but sore feet. I do not have seat 16K, but I do have seat 37B, which is next to an over-wing emergency exit and thus affords five feet of legroom and occasional squashed ankles when the cabin crew use it as a passing place for laden trolleys. London is still where I left it though there is uncertainty as to whether the driver knows this; he certainly has to think a while before he can remember that we have come from Denver. Yet again no HMRC people on the way out; I rue the missed opportunity to smuggle in a million fags at Colorado prices. Escape the building for a fag of my very own, while watching three Goons in a Fountain - in this case riding Bromptons up and down the water feature between T5 arrivals and the bus stops. They are joined by a grinning paramedic on a mountain bike. Walk the length of T5 looking for the National Express ticket office. Walk the length of T5 again after discovering it's ten yards from where I exited Customs. Bah! M25, Woking station, taxi. There is a lot more legroom in the back of a Merc E-Class than in Sergeant Aten's Crown Vic. Yes, except for having put the prices up and moving the butter and, alright, it's not much like that at all. But the M25 is much like it ever was and, in fact, was so-o-o-o frabjous that I did Fort Larrington-Watford-Fort Larrington-Larrington Towers this afternoon, due to leaving my jacket behind. And pikeys tried to rob Larrington Towers while I was away but were defeated, in the absence of a butler with a swan-off, by the front door.